While a normal day at the office is often punctuated by boring tasks, for some people within the corporate rank and file, there’s just too much damn stimulation. 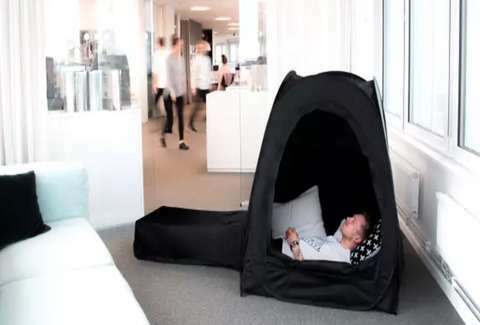 For those of us suffering under the demands of a stressful open-floor workspace, there’s the Pause Pod, a contraption that promises to shut out the sights and sounds of your lovely coworkers. And no, it definitely isn’t a tent, if that’s what you’re thinking. If you didn't make it to the end of the video, the Pause Pod is basically a portable dog house, but for humans who work in professional settings. It retails for $199 and you can fold it up and sling it over your shoulder. It's meant to help you decompress between meetings by sleeping on the floor next to your desk or the office water cooler. It's also equally great for meditation -- like a Buddhist temple, but engineered by the brains of Silicon Valley. I want to know what could be stressful about working somewhere where whipping out a tent in the office doesn't draw any attention? This cool & all but what if I wanna sleep on my side?? And to think I was ANTI nuclear annihilation just last week. Sleeping is made easier by some baggy canvas that extends out from the Pod's base, similar to a sleeping bag, but not in the exact traditional sense. The Pod has already bested its fundraising goals, and you can order one right now at a 50% discount if you'd like to change the archaic rules of corporate office culture by sleeping on the floor, or perhaps in a hallway. Just don't be the jerk who parks one in front of the coffee machine.